Mekong Dam Victims - Cambodia. 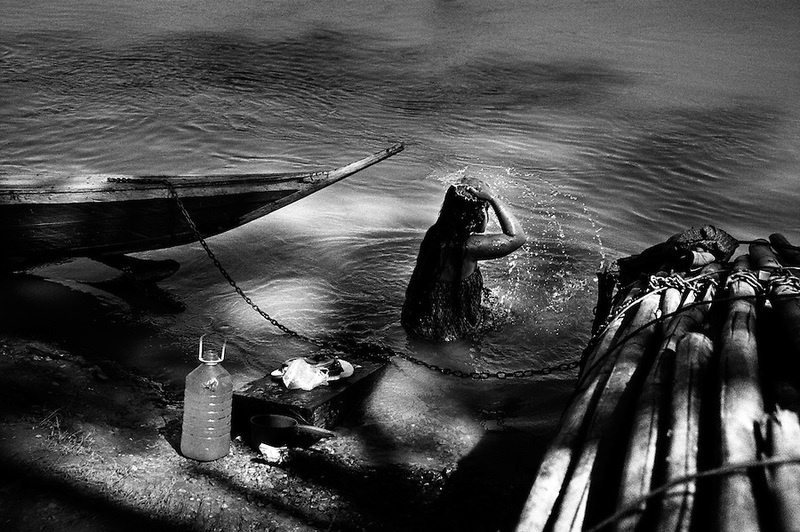 A girl taking her morning bath in the Sesan river. After the construction of big dams up-river in Vietnam, people living down-river in Cambodia have been suffering problems with skin-diseases, without knowing the exact reason. Occasionally the locals have seen strange colours, foam and bubbles in the river. At least 55.000 people living near the Sesan river in Cambodia's Ratanakiri and Stung Treng provinces continue to suffer due to lost rice production, lost fishing income, drowned livestock and damaged vegetable gardens, and so also great economical losses, because of the unpredictable floodings from the Yali Falls Dam on the other side of the border in Vietnam. To this day, flash floodings have caused the deaths of at least 39 villagers from various ethnic minority groups living along the river. Despite this, four other major hydropower projects are now in operation or under construction on the Sesan River in Vietnam. Known as "The Mother of Waters", more than 60 million people depend on the Mekong river and its tributaries for food, fresh water, transport and other aspects of daily life. The construction of big dams is now threatening the life of these people aswell as the vital and unique ecosystem of the river.